We are manufacturer and supplier of Eyes washer , eye washer bottle , Hand shower, Full body shower, Emergency shower, Safety shoes, Safari Pro safety shoes , Tiger safety shoes, Allen cooper safety shoes to various cities like Delhi, Noida, Ghaziabad,Mumbai, ahmedabad, chennai, bangalore, Faridabad, Gurgaon, Sonipat, Ambala, Karnal, Bhiwadi, Neemrana, Bulandshahr, Kanpur, Lucknow, Varanasi, Allahabad, Dehradun, Haridwar, Chandigarh, Shimala, Panchkula, Ludhaiana, Gwalior, Jhansi, Agra and many more. 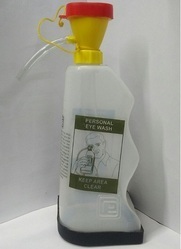 Eye Washers are being offered by us exclusively for our domestic as well as overseas clients. These washers are used to clean, refresh or soothe eyes and are highly beneficial in removing loose foreign material, air pollutants, dust or chlorinated water.